Welcome to the government sugar/industrial/drug complex. Sugar—in all its forms—is considered the primary cause of type 2 diabetes. It also suppresses the immune system, is linked to cancer, and leads to cognitive problems, as we reported last year. Government subsidies, taking a great variety of forms, are increasing rather than decreasing. Diabetes drug sales are now $35 billion with other related illness sales even higher. Let’s see how all this connects. The US is the world’s largest sugar producer. We produce an average of 8.1 million tons of granulated sugar every year. Since the mid-1990s, sugarcane has accounted for 45% of the sugar produced domestically, with sugar beets providing about 55%. By 2010, genetically engineered varieties accounted for about 95% of sugar beets, up from 60% in 2008. High-fructose corn syrup (HFCS) is derived from the milling of corn. Production of HFCS increased from 2.2 million tons in the 1980s to an average of 9.2 million tons during the 2000s. 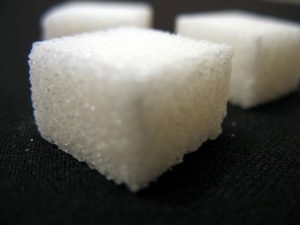 In general, deliveries of sugar (raw cane sugar and sugar beets) and other sweeteners (corn sweeteners, honey, maple syrup, and edible syrups, excluding no caloric sweeteners) averaged about 21 million tons during the 2000s. The US Department of Agriculture makes loans every year to processors of domestically grown sugarcane and sugar beets as part of the 2008 Sugar Act. HFCS processors, on the other hand, benefit from corn subsidies (also reinforced in the 2008 Farm Bill). Last October, sugar processors (both beet and sugarcane) borrowed $862 million under the price support program—loans secured with some 4.1 billion pounds, or 2.05 million tons, of sugar that companies expect to produce from the current harvest. The loans did little to keep sugar prices high, however: they have fallen 18% since October. According to a Tufts study, one reason may be that the elevated price of raw sugar and sugar beets enable HFCS processors to undercut sugar producers with their cheaper product, thus making the sugar worth less. Sugar processors are afraid they’ll have to default on their loans, which could result in $80 million in losses to the USDA’s price support program. USDA is considering helping them out once again—this time by buying 400,000 tons of sugar, just so they can pay back their loan! Keeping sugar prices up of course means that consumers spend more. According to a study commissioned by the Sweetener Users Association, the program costs consumers $2.9 billion to $3.5 billion annually. A bipartisan group of senators wrote an article for the Capitol Hill newspaper The Hill in which they said that by controlling the sugar supply, our government is boosting prices and those higher prices cost the country 20,000 jobs each year. Of course, part of USDA’s excuse for rubberstamping GMO sugar beets was that the economy depended on sugar production. Hmm? Why is this happening? Why is the government gouging consumers and encouraging an industry which contributes to so much illness? Sugar makes up only 1.9% of the total value of all US crops, but the sugar industry accounts for 33% of crop-related lobbying dollars. They also give 55% of crop-related PAC donations—more than all other US crops combined. An intensive public relations campaign that started in the early 1970s was able to sweeten public opinion about sugar in a major way. The industry bankrolled scientific research. Each research proposal was overseen by a panel of industry-friendly scientists plus a committee of representatives from sugar companies and “contributing research members” such as Coca-Cola, Hershey’s, General Mills, and Nabisco. Unsurprisingly, each of the studies they funded seemed to point to sugar’s safety. No independent research showing how dangerous sugar is was considered for funding. Big Sugar even contributed to supportive FDA and USDA rulings on sugar: leading the panel that evaluated sugar for the FDA was a former chair of the scientific advisory board for the International Sugar Research Foundation. By now the cover-up has frayed. Everyone knows that sugar is a health risk. You may recall our article in which we reported that type 2 diabetes has increased by 90% in the past decade. A new study, published in the peer-reviewed online journal PLOS One, finds a direct correlation between sugar and diabetes—a correlation that is independent of other factors such as obesity, aging, exercise, or tobacco and alcohol use. The study concludes that “Duration and degree of sugar exposure correlated significantly with diabetes prevalence in a dose-dependent manner, while declines in sugar exposure correlated with significant subsequent declines in diabetes rates independently of other socioeconomic, dietary and obesity prevalence changes.” In plain English, they found that the more sugar you consume and the longer you consume it, the higher your diabetes risk; and as sugar consumption drops, diabetes rates drop as well. The CDC says there will be nearly 140 million diabetics in this country within the next forty years. Diabetes drugs are big business—they bring in $35 billion now, but are poised to jump to $58 billion by 2018. Think about that. If diabetes drugs make so much money, the pharmaceutical industry has a reason not to try to cure the disease. Meanwhile your government is supporting both the sugar industry and the drug companies. And not only are the drug companies—like the sugar producers—big campaign donors. They are also providing much of the funding of the US Food and Drug Administration. The link between chronic diseases of all kinds, government policies and subsidies, and drug profits is not a pretty one. But knowing what is going on is the first step toward cleaning up the system.